COLORADO SPRINGS, Colo. – Private rocket builder SpaceX is trying to speed up testing of its new Dragon spaceship to enable it to visit the International Space Station on the next demonstration flight. With NASA's space shuttle programset to retire later this year, the pressure is on for commercial providers to compensate for the loss of the shuttles' enormous cargo-carrying capability. SpaceX's demonstration flights are part of NASA's Commercial Orbital Transportation Services program, which is designed to stimulate the development of private vehicles capable of ferrying cargo to the space station. As part of the COTS program, NASA is offering SpaceX $278 million for successful demonstration tests of a vehicle and hardware that are up to the task. SpaceX's Falcon 9 rocket and Dragon capsule completed a successful first demonstration flightunder the COTS program in December 2010. That mission marked the first time a commercial company had ever launched a spacecraft to orbit and then safely retrieved it after landing. The next test flight most likely will occur in late September or early October, Musk said. On its first demonstration flight, the Dragon capsule launched into orbit on SpaceX's own Falcon 9 rocket on Dec. 8, circled the Earth twice and splashed down in the Pacific Ocean. In its current configuration, the Dragon capsule is also capable of ground landings, Musk said. While such landings would require some subsequent repair work on heat shield tiles, the capsule would experience loads that are "less than loads that parachuters experience," and would still be reusable, he said. Ultimately, however, SpaceX hopes to modify the Dragon so that it can make vertical propulsive landings, similar to the way the Apollo program's lunar modules landed on the moon. "Long term, our goal is not only to land on land, but to land propulsively," Musk said. "For maximum reusability, you want to land propulsively." SpaceX's Dragon space capsule is shown after its first successful orbital flight, re-entry and recovery in December 2010. 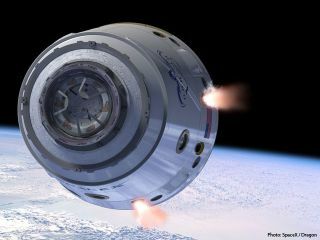 In addition to the company's work on cargo delivery, SpaceX has submitted a proposal to NASA's Commercial Crew Development program to begin developing a version of the Dragon capsule to carry humans into orbit. SpaceX also recently announced plans to develop a new unmanned heavy-lift rocket that would be the most powerful commercial rocket ever built. The rocket, called the Falcon Heavy and described by Musk as "a Falcon 9 with two additional first stages," would be able to carry about three times as much mass as the Falcon 9 boosters can.